This article provides a navigation to the entire Gradebook options available in the School Loop portal. The easiest way to access your current Gradebooks is to use the Gradebooks menu on the horizontal menu bar near the top of every page of your account. Alternately, you may use the Gradebook links in the Dashboard of your portal homepage. The title of your Gradedbook - editable. Indicates other staff persons to which you have given access to your Gradebook - the Co-teacher feature must be enabled. View Tabs - Numbered tabs indicate the periods you teach for a given course; All Grades shows a summary of student scores by category; Published Grades also shows a summary, but only for those grades you've published for students and parents. Assignment List displays all assignments created for course. Reports shows a number of printable reports. Tools - Easy access to tools such as add/edit Gradebooks, the seating chart, drop lowest score, print reports, transfer grades, and more. Start/End dates for your Gradebook. Weighting - Indicates if weighting is enabled for the Gradebook. Gradebooks - dropdown list of current Gradebooks. Mode - Options for how your Gradebook displays information include Points (raw scores), Percent, and Locked (scores). "Show Dropped" button displays dropped students with strike through. This button toggles between "Show Dropped" and "Hide Dropped". 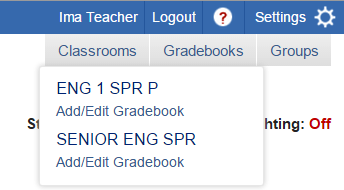 There's also a convenient button for adding new assignments to the Gradebook. Save grades you've entered or Publish a progress report for parent and students to view. Go To menu - Quickly jump to any assignment or change views page by page. Reorder assignments or Reorder Students with a simple drag-and-drop interface. Auto fill empty cells with any value. Assignment Details - Title, max points, and class average. The Green dot indicates that you've published the scores for that assignment for parents and students to view. Hover over the assignment title for access to more details and links to edit, copy and delete. Your students and their current gradebook average. Click the envelope icon next to a students name to start a LoopMail message to the student, their parent, and anyone listed on their Learning Management Team. Click a student's name to access the student scoresheet.